Dr Inigo san Millan has been a friend of mine for years. He’s been working in breaking edge technology with training, free radical monitoring, and fatigue evaluation. He’s tested hundreds of top level professional riders, and has the most complete database of physiological data of any physiologist working in the professional peloton. I assumed he was talking about Christian Vande Velde, but he soon corrected me. I’ve been watching Tom’s career since he tried to blow my doors off at the 2001 Boulder to Breckenridge road race. He was a young, unknown rider who came out of nowhere. He isn’t the typical professional rider that came from junior ranks, steadily groomed through the under-23s, until they finally reached the pro level. No, Tom started racing when he was around 20 years old. He was a chubby little college student trying to get fit, look cool for girls, and have fun racing his mountain bike. He moved up the ranks quickly in mountain biking, but didn’t really flourish until he lost a considerable amount of weight, and started road riding at the same time. He was instantly winning. He won the Tour of Qinghai lake about a week after getting a pro license and still unfamiliar with how aero bars worked. 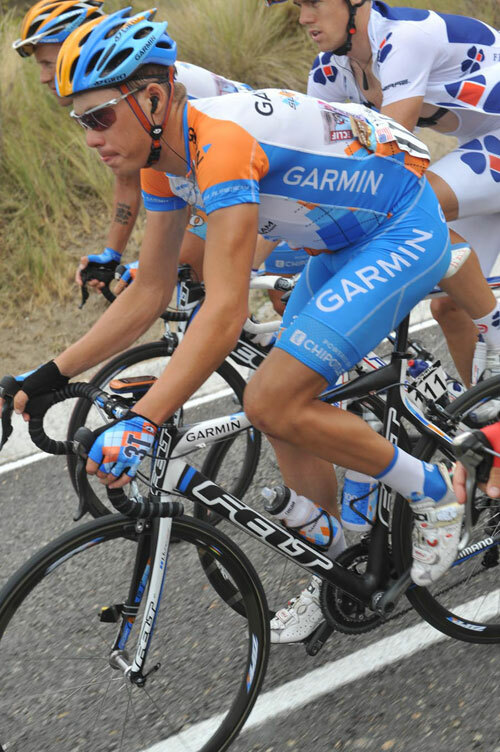 He won the Tour of Langkawi, the first race of his first full professional season. Here was a 24-year old rider who had never ridden one day as a junior or an under-23 in Europe, who thought that Eddy Merckx was the name of a bike shop, and the only reason that Belgium was famous was for waffles. His bike handling skills were poor, he had no tactical knowledge whatsoever, but he was winning and winning up big hills in impressive ways. Tom was the new golden child of the USA. A country looking for the successor to Lance Armstrong had a young, gifted, and eager talent winning races in foreign lands. Expectations were very high. He found a contract with Fassa Bortolo in 2004, which was probably a rough place to start, but he had to get his feet wet somewhere in Europe. After a year of starting to learn the ropes, he signed with Discovery Channel, and was quickly put under the wing of Lance Armstrong himself, as the ‘great white hope’. Danielson performed well, and won the largest race in the USA at the time, the Tour de Georgia in spectacular fashion. Dropping Floyd Landis and Lance Armstrong on the finishing climb on the hardest stage was something that made the American cycling community, hungry for a new hero, take notice of this Lance protégée even more. So, going into his first Grand Tour, the Giro d’Italia, he had the pressure and expectation of being “the next Lance Armstrong” soundly placed on his shoulders. This is where the story of Tom Danielson starts to become one of an enigma as opposed to one of a prodigy. He clearly felt the massive weight of the expectation on his shoulders. He wasn’t able to finish the 2005 Giro, due to a hurt knee, but the worry on his face showed something more was at work. I started coaching Tom Danielson at the end of 2008. After a miserable season trying to come back from injury, massive weight gain, and illness in 2008, Tom came to me, looking for a way to start his career back on the right path. We looked at how in many ways Tom had made improvements, and in others he had regressed. Since he had been heavy and in bad form in 2008, he had been racing in many flatter, crosswind type events, that he didn’t want to attend, but that were teaching him a great deal. This had finally taught him how to be a bike racer, in the way he’d never gotten to learn as an 18-year-old kid racing in Belgium. Also, he had to help his teammates, on a day to day basis, getting water bottles, chasing breaks on the front, fetching rain coats, and other menials the he’d never had to deal with before. However, the net effect was positive. Tom had been humbled and sometimes with humility comes the best learning. He was, for the fist time, not seen as “the next great” but instead as just a teammate. So, when he came to me at the end of 2008, it was trying to figure out how he could start getting results again, as opposed to water bottles. We had a long talk and started, piece by piece, to figure out the unique puzzle that is Tommy D.
Tom Danielson in 20 per cent Eskimo in his heritage, and this probably contributes to what I can only describe as a uinique metabolism. He has a strong tendancy to store fat, not use it as fuel, if untrained. You can see this in any photo of Tommy D. He can never get down to the vein popping five per cent fat you see in some riders. He just cannot do it, not matter how much he starves or trains. In addition, this metabolism tends to strongly favour sugar as fuel. When Tom eats carbohydrate, his body wants to just use it up as fuel, then shut down, and store all the fat ingested as body mass. I suppose this is to protect against arctic winds, but it’s very difficult to work with in a cyclist. Not only does his body want to be chubby, naturally, it also gets the hunger knock very easily, as naturally, his body doesn’t like to use its fat stores as fuel. So, he’s a rider that has to eat a lot to keep from getting hunger flat, but gets fat, quite easily, from eating a lot. Tough. Then you throw in the fact that this very sugar based metabolism causes high lactate levels and you have a rider that will clearly have wildly fluctuating form. If he eats too much, he’s fat and acidic; too little and he goes hunger flat. Or both. This is the cause of the maddening unpredictability we see in Tom. Last winter, we set a new diet and training plan to get this fixed. It was a very fat/protein based diet, which was very hard for Tom to follow. He was seeing stars on every training ride, and had given up all of his favourite foods. He was eating like an Eskimo, but still training hard. It took time and discipline for him to adapt. However, by our New Mexico training camp in 2009, it seemed he had turned the corner. Tom was doing six hour rides without having to stuff his face with sugar, and he was doing them without crashing hunger flat. It was incredible to see the progress. He was also considerably lighter, almost eight kilogrammes, than he had been in 2008. At the camp itself, he was easily the strongest rider on the team, climbing away from everyone else whenever he felt like it. What was interesting to me, though, was how nervous and competitive he was, just at this training camp. While most of the other riders dragged themselves out of bed each day and just got on with the work because the had to, Tom was clearly seeing this as an event, and was out to prove himself at every turn. That in itself isn’t challenging, but when we got to the Tour of California, I saw that fat metabolism wasn’t the only thing that was different about Tom. They say there is bell curve with nervousness and adrenaline vs performance. Not much nervousness and adrenaline, and you aren’t stimulated enough to peform at your best level, but too much nervousness and adrenaline, and you lock up and freeze. Most riders at a training camp will be at the low end of this curve. Not nervous at all, at they plug away getting ready for the season. Tom, however, was right at the peak of this curve on the desolate roads of New Mexico. The amount of stimulus and competiveness provided by 20 teammates and staff had him functioning at the peak of this curve. He was stimulated optimally and performing incredibly well. I didn’t think much of this until we raced at Tour of California. I could see that when he was around 150 riders, instead of twenty, not to mention countless media, staff, vehicles, and other nerveracking stimuli, he went from optimal to tense, jittery, unfocused, and clearly way over to the other end of the curve, where performance deteriorates due to adrenaline. While the other riders’ levels were raised by the race, Tom’s level went off the cliff. I don’t know if this is from the massive expectation put on him early in his career, or if it’s from his background, or if it’s just Tom’s way. Probably a combination, but its hard to watch, as you see him shoulder the weight of the world in every race. He feels every comment, every change, everything. His mind races. It must be overwhelming to deal with. He performed OK in California, but clearly below where he was at camp, and as he made the trip to Europe, where the pressure was even greater, you could see clouds forming over Tom. He could no longer control his diet as well in races, especially in Europe, so nerves, plus pressure, plus different food – it was all adding up again. Tom started gaining weight and collapsing his health all at the same time. We’d figured out how to fix his body, but not his mind. Once again, Tom struggled through many races, unable to show the ability that Inigo was jumping for joy about just six months earlier. After the Tour of Switzerland, he went home, focused on regaining form and figuring out how to train his mind. Indeed, Tom was climbing in the first group, every day, but we were all just praying the Vuelta would be over soon, before all the nerves would catch up with him. He’d made so much progress, but was it finally enough to get him through a three week race? With three days to go, Tom dropped out with bronchitis. No, not his fault, not anyone’s. We’d made it so close to the end. So close to finally making good on the promise and massive physical talent. It was heartbreaking to see him break. Heartbreaking to watch so many others shake their heads and write him off, once again. The “great white hope” had made progress in so many ways. He now knew the roads of Belgium and the work of a domestique. He knew the work and suffering it takes, no matter how much talent. He finally had learned all the lessons he didn’t get in his early years. He had overcome so much, but not enough. It still had fallen short. So, why keep trying, some people ask me? Well, for most riders they face the challenges presented by a body less gifted than Tom’s, but more robust and stable. They don’t have the ability he has, but they have it harnessed much better. While their challenges are more familiar to most of us, and easier to understand, that doesn’t make them any less of an obstacle. At the end of the day, figuring out Tom is like climbing a mountain. Not easy, not fun, and many say you can’t do it. You can see the impressive peak in the distance, but it never seems to get any closer as you plod along. Hopefully we’ll get there soon, as I’m exhausted.